Research has shown that 20-year-old Americans get either too little sleep or poor sleep quality. This is due largely to stress- when there is a work overload, sleep tends to be the first thing that gets put on the back burner. This poses a huge problem because sleep affects just about every way that your body functions. Herein lays our challenge- to change the way 20-something-year-olds behave in regard to sleep. Welcome to Rêve: a native iPhone app that will change these poor quality sleep behaviors via a technique called lucid dreaming. 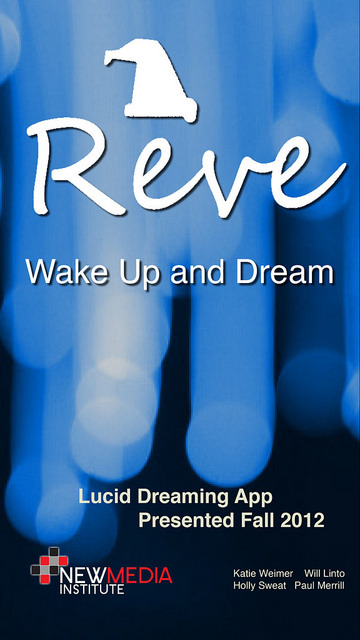 Rêve, meaning ‘dream’ in French, instructs the user how to lucid dream, offering tools, tips and techniques. But what exactly is lucid dreaming and why will it change your attitude towards sleep? Lucid dreaming is when a sleeper enters REM and becomes aware, while they are sleeping, of the fact that they are dreaming. Once they are aware of this they have the ability to control their dreams and do practically whatever they wish. Our end goal here however is NOT simply to get the user lucid dreaming- the lucid dreaming is a means to an end. If you practice the techniques properly then by default you will be engaging in healthy sleeping behaviors (e.g. to lucid dream you must get more sleep, relax before going to bed, etc.). Lucid dreaming is a way for us to incentivize and gamify sleep – because, who doesn’t want to dream about going on a date with Brad Pitt or flying through the sky? We want to get the user excited about going to sleep and willing to make more time for sleep by making it as rewarding of an activity as anything else you might want to be doing instead. The technologies we plan on using all help increase the likelihood of lucid dreaming such as a recording device to recall your dream right when you wake up and reality check reminders throughout the day to get your mind used to knowing whether it’s awake or asleep. Close your eyes, wake up and dream!